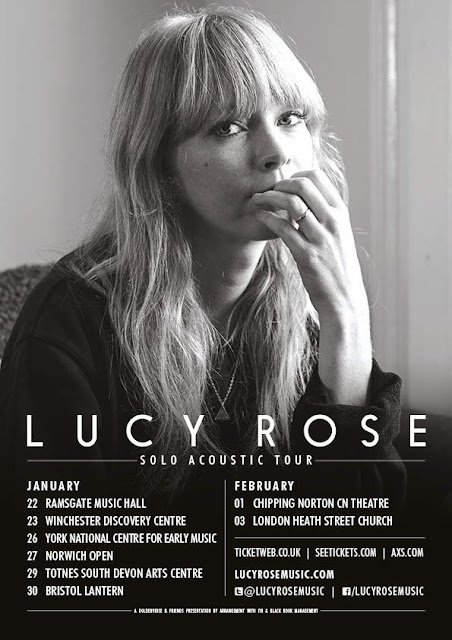 Brilliant news - Lucy Rose (Bombay Bicycle Club collaborator) has announced a string of 8 acoustic shows in intimate venues across the UK in January and February. Posting a week ago on her Facebook page, Lucy said that "I always want to play the songs you guys want at gigs so I felt bad in Oxford on the last tour when I heard someone shouting for Nightbus, Be Alright and Gamble. So I promised the audience I would come back in January and play a small solo acoustic gig where I could play those songs." And, true to her word, she's playing a show in Chipping Norton (just North of Oxford) and in a few other places around the country, culminating at Heath Street Church in London. I'd certainly recommend getting along to a show whilst the opportunity to see Lucy in this size of venue arises as she's certainly growing a loyal fanbase and her recent album, Work It Out, has been received to high acclaim!